Should I Buy a Used Restaurant POS System? The decision of what restaurant POS to buy is a big one and should not be taken lightly. After all, a Point of Sale system is a big investment that can result in big returns. However, many business owners have an understandable desire to save money on this investment. Maybe you’re one of them. If you are, you’ve probably wondered about the risks associated with buying a used restaurant POS system. Today, we hope to help you feel confidence in making this investment in your business. When you buy a used POS system directly from a restaurant, the equipment may be greasy, sticky, full of coke...who knows? However, there is a difference between a used POS system and a refurbished POS system. Refurbished computers can have brand new touch screen monitors, card swipes, cash drawers, and more so what you’re really getting is a mostly new package instead of a stinky, greasy, syrupy, unreliable mess. Additionally, POS systems are usually designed and programmed to be used in a certain industry or by a certain business. Buying a used system from the original user can lead to many unforeseen programming difficulties. If you choose to buy a used system from another business, make sure you contact the system vendor so that you can get their help in determining what kinds of costs you’re looking at for software licensing and/or system reprogramming. There is, however, a better way to save money on a restaurant POS system without risking running into the types of problems listed above. The right way to buy a used POS system is to order from a legitimate secondary market provider. In fact, some vendors even offer used restaurant POS systems that include a warranty and have support, upgrade and licensing options so that you don’t have to worry when you run into trouble. In the end, it really boils down to doing your homework before committing to a big investment like this and finding out what is the right option for you and your restaurant. If you’ve decided to open a restaurant, there are a lot of things you’ve probably thought a lot about. Hopefully, some of these include concept, location, recipes, vendors, location, decor, and...location. If any of these elements have not been a big part of your planning, you should probably take a step back and figure them out before you move forward. Opening a restaurant is expensive, both in terms of time and money. You want to make sure that you get it right so that your new business can succeed. While the elements listed above tend to be front and center in the mind of a potential restaurateur, there are other things that may not cross your worried and harried mind until it’s too late. We’ve put together a list of 5 undervalued or overlooked elements to opening your own restaurant. Having a signature dish isn’t something a lot of people talk about, but it’s definitely something worth thinking about. It doesn’t matter what it is, but you should have something that is exceptional on your menu. This is the item that makes people say, “Hey, let’s go to that one restaurant, they have the best ________________ !” In the age of social media, you may think that word of mouth is dead, but that’s not true. Word of mouth is alive and well, and it’s found a comfortable home online. Social media can make or break a businesses these days. Finding your signature dish and encouraging your customers to post or tweet about it can make a huge difference to your success. There’s a lot to consider when deciding on your pricing. You’re opening a restaurant to make money, and the profit margin on restaurants is lower than in many industries. That means your prices have to be exactly right—like Goldilocks right. Your prices have to be high enough to cover your overhead with a little left over at the end of the day, but they can’t be so high that people won’t be willing to pay them. The all-important location plays into this one, too. If you want to open a fancy steak and seafood restaurant, you don’t locate it in a low-income area. Most people seriously underestimate the amount of money they should have in reserve when they open a new business. The sad truth is, it takes time for a restaurant to really find its stride. To be quite frank, you should probably have enough money in reserve to run your restaurant without any monetary inflow for several months to a year. Equipment breaks, customer bases take time to establish, and disasters happen. A good reserve lets you stay open despite early setbacks. If you really want to survive, a restaurant computer system can really make a difference. They represent a big initial investment, but they tend to be worth it. These systems are designed to help you with everything from ordering and receiving to employee data. They can even help you track sales volume and food waste. A good restaurant computer system can save you a lot of time and hassle when it comes to the large quantity of paperwork it takes to run a successful restaurant. Face it, it’s going to take a few days or weeks for everything to start running smoothly. A cold open gives you the chance to work out the kinks before your Grand Opening. Unfortunately, the only way to find out if your equipment works right is to use it. A cold open gives you the time to find things that aren’t working right and fix them. It also gives you a chance to make sure your new staff gets the chance to learn how to work as a team. People that come in during a cold open expect things to be a little rocky, so it’s okay when everything doesn’t go perfectly. We’re not going to lie to you, opening a new restaurant isn’t going to be easy. However, we hope that these tips help you to be successful in doing so. Follow your dream, and make it worth the time and money spent. Having modern and efficient Point of Sale systems can help your business tremendously. Learn more about the elements that make up quality POS systems. 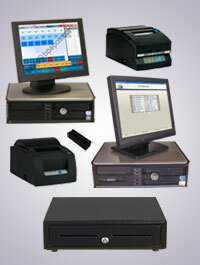 A POS system, or point of sale system, is instrumental in the operation of a successful restaurant. This is equipment that facilitates the ordering and checkout process, and these functions ultimately promote efficiency within the restaurant. Without a POS system, your staff may be required to physically jot down orders on a notepad, hand them to the kitchen staff, and compute totals with a calculator. While there are several systems available for you to consider, the best restaurant POS systems can be found at Business Software Solutions. Business Software Solutions provides you with a turnkey POS option because you can purchase the hardware and software together in one package. Each restaurant has unique needs when it comes to a point of sale system, and because of this, there generally is not one system that is best for all needs. Everything from the number of terminals to the features in the software program will affect usability in the restaurant facility. Through Business Software Solutions, you can find multiple hardware options, and the software programs have functional features that can truly transform the way you do business. 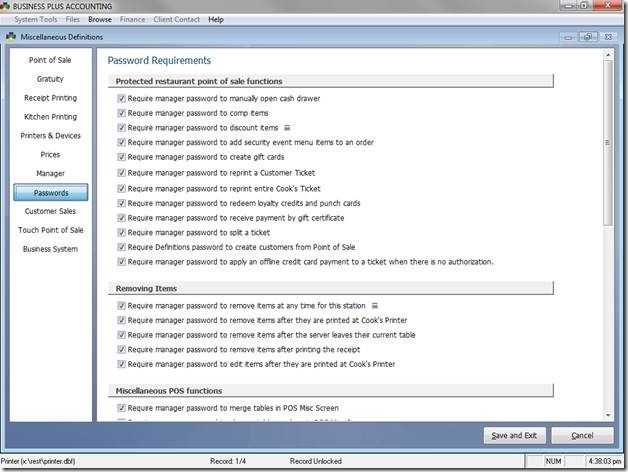 For example, there are standard ordering and checkout features in these software programs. In addition, there are features that track inventory in real-time, that facilitate accounting functions, and that even integrate a time clock into the system for enhanced payroll processing capabilities. Not every restaurant has the need for each of these features, and some only need a very basic POS system. However, when you want to get the most use out of a point of sale system, it is important to select the restaurant POS systems that are suitable for your business's operations. You can take time to review the hardware and software solutions available through Best Software Solutions today, and you can make a selection that is right for your company. These are cost-effective solutions, and the solutions are even more affordable because you can choose between new and used options as a cost-saving alternative. Review the options today, and you will find the best software program for your point of sale needs through Best Software Solutions. What Can a POS System do for you? Our POS System can do so much to help manage your restaurant. Everything from allowing staff to clock in and out to managing your menus. Our Restaurant Software and our Multiuser Restaurant Point of Sale Systems will give you the business software solution you need. Built on top of an award winning, mature accounting system and designed by working closely with the owners and operators of many different restaurants, BPA Restaurant Professional gives you the tools you need to run a better business. A POS system can greatly increase the efficiency of your business. A point of sale system grants you control over virtually every aspect of your restaurant that you need to focus on to increase maximum efficiency. It can help you streamline the following aspects of your restaurant into one cohesive operation: business operations, inventory, and vendor management. A POS system can also help you increase your customer relationship management, purchasing process, and your reporting and analysis procedure. However, the point of sale system that works for one restaurant might not be the best one for another. Fortunately, there are a few tips that you can keep in mind to help you choose the best system for your restaurant. First of all, you should define your restaurant’s needs. For instance, you might need to focus more on customer relationship management than inventory reporting. Defining the needs of your restaurant can help you ensure that you select a system that is optimized for the area that you need the most help in. Additionally, you should determine what type of hardware is needed for the system that you’re considering buying. Some systems require you to purchase external hardware to run them, whereas others might operate on existing equipment that you already have. This can affect the budget that you have set forth to spend on a system. Having to purchase external hardware can drive up the costs of your system, which could cause you to go over your allotted budget. Just as you would compare any other investment, so should you do your research and compare various systems before committing yourself to purchasing one. Evaluate the pros and cons of each system that you’re considering purchasing. Of course, ensure that you select the system that offers the best features in the areas that you need to focus on in your business. At consumer-level glance, there may not be much of a difference between a retail POS system and a restaurant system. However, a great deal of differences exist. One of the major differences between the two systems is the number of units and accessories that each one needs. A retail system will have accessories such as credit card scanners, printers, and product scanners attached to it in the main service area. A second or third system in the back office will have a printer and an inventory scanner attached to it along with inventory maintenance software. A restaurant POS system usually consists of one unit that controls everything. Another area that a retail POS system differs from a restaurant system is its complexity. A restaurant system will have a menu that is easily customizable by entry-level employees. This customizable menu option allows for increased speed of service to the customers. Retail POS units use complex menus and software. Staff members such as managers and assistants will have access to inventory and sales information, while regular employees will only have access to manipulate items at a point of sale level. A restaurant system may be much easier to use than a retail system. The tracking system in a retail establishment differs from that of a restaurant establishment as well. Retail locations have far less items to track than restaurants have. Restaurants have to track hundreds of different ingredients such as condiments, stationary items, meal ingredients, toys, coffee flavors, and the like. Therefore, a restaurant point of sale system will need to have advanced software that can perform such tasks as stock level maintenance and ordering. Restaurant staff members also have to be connected to this system so that the computer knows when an inventory item is sold or used. Finally, retail systems are usually the same throughout the market or jurisdiction. Restaurant systems are tailored to the needs of each independent store manager or business owner. 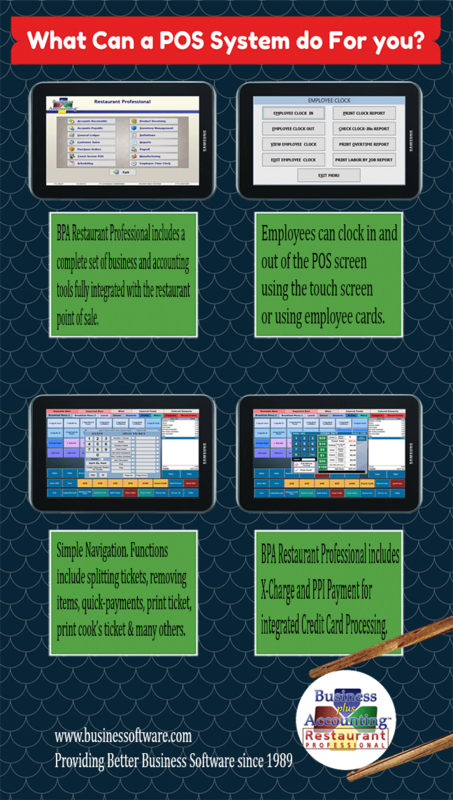 When running a restaurant, make the process a little easier on yourself by using a restaurant POS system. Efficiency is vital in a busy restaurant as it can affect your overhead as well as your ability to serve your customers in the best way possible. One of the best steps you can take today to improve the functionality and efficiency of your restaurant's operations is to invest in an updated point of sale system. These are special systems that are designed to facilitate the sales process, and some POS system models are designed specifically for restaurant use. Restaurants often have specialized checkout needs that you will not find in retail stores and other venues, so the specialization of a system is important. You can find the best selection of these systems designed specifically for use in restaurants through BusinesSoftware.com. When you take a closer look at the different models of point of sale systems available for you to choose from through BusinessSoftware.com, you may discover that these are highly affordable yet very functional models that are ideal for use in your restaurant. Many have multiple user stations, but they are linked to a central hub for functionality. They make it easy for restaurant staff to ring up sales for customers, and some even have a convenient touchscreen that can be customized based on your menu options and other factors. In addition, they also can provide you with enhanced backroom functions, and your accounting or bookkeeping staff will love the detailed reports that these systems can generate. They can print receipts for customers to sign, accept credit card payments, and perform other necessary functions for you. There are several options to consider when you are shopping for a new POS system for your business, and you can find the best options available through BusinessSoftware.com. You can begin by exploring the different models available. You can also inquire about the features and functions directly if additional assistance is needed. Upgrading your point of sale system may be one of the best steps you can take for your restaurant, and there is no better time than right now to begin learning more about the options available. 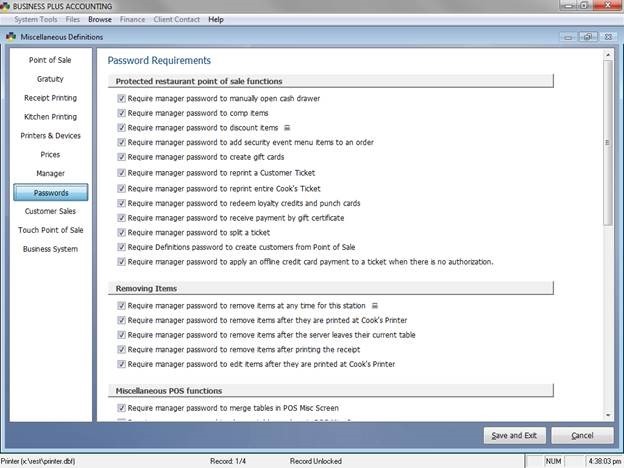 BPA includes much flexibility for setting up manager/employee passwords in the system. BPA includes three levels of manager groups that allow you to give different levels of access to different managers/employees. 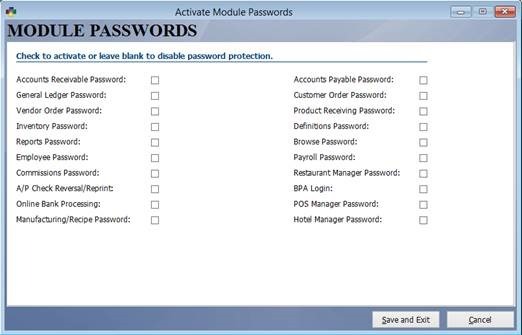 This guide will walk you through setting up manager/employee passwords in BPA Restaurant Professional and Delivery Professional. Manager swipe cards may also be used in place of passwords. The password setup is done in the Business System portion of the software. 1) From the main menu select Business System. 2) Select Definitions on the right hand side. 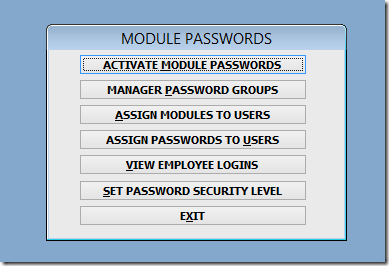 3) Select Passwords for Modules and enter the master password. 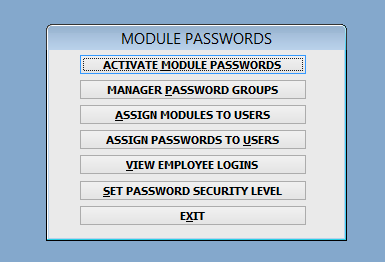 In Activate Module Passwords you may choose the areas of the software that you would like password protected. For the restaurant software you will want to check the option Restaurant Manager Password. Selecting this option will allow you to secure areas and functions in the restaurant system as well as password protect the Business System. 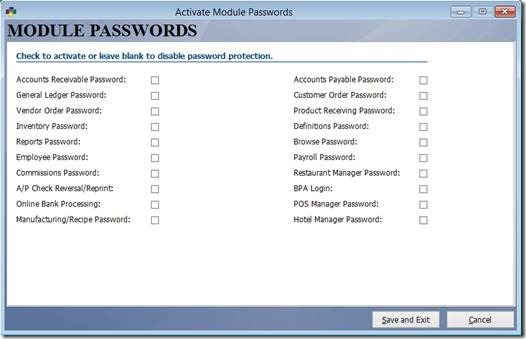 You may choose to select any other modules that you would like password protected separately. The restaurant software allows you to set up 3 different levels of manager groups. 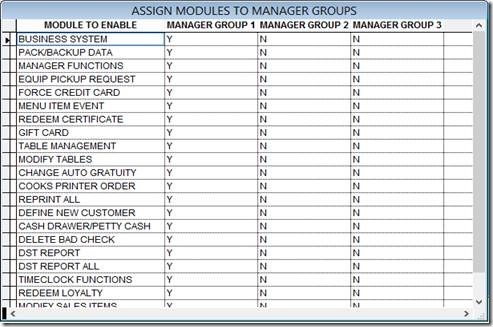 These manager groups can have different levels of access. You may assign as many employees as you choose to each manager group, which will be discussed later in this guide. By default, manager group 1 has access to everything in the restaurant system (this can be changed). To allow a manager group to have access to the specific group of functions, place a “Y” in the appropriate row. For example, if you would like manager group 2 to only have access to remove or comp items place a “Y” next to Modify Sales Items. Below is an explanation of some of the functions that are included in each module. Each manager/employee may be assigned a certain level of access. Here you will choose the areas of the software the manager can access with their password. 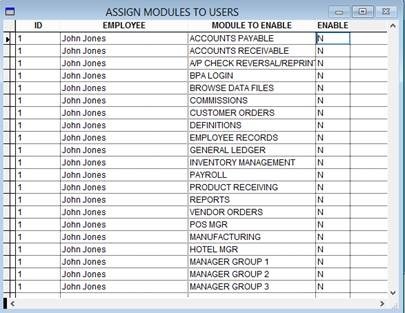 Select Assign Modules To Users and enter the employee’s number. Press enter and you will be presented with a table that allows you to give that employee access to specific modules with their password. Place a “Y” in the appropriate row to enable access. You will want to assign each manager/employee to one of the three manager groups at the bottom. Here you may assign passwords to each employee or manager. Simply select Assign Passwords To Users, enter the employee number and press enter. Enter the new password and verify it. If you are using manager cards, swipe the card into the new password field. Swipe it again in the Verify Password field. If you need to change the password that is currently assigned to an employee, enter the current password. If you do not know the employees password you may enter the master password in the Current Password field to override the current password. Once you have set all the password options in the Business System, you will want to take some time to review the specific functions that can be password protected in the Restaurant System. From the main menu, go to Restaurant System > Manager Functions > Misc Definitions. Select the Passwords tab on the left side. Check the box next to any specific options you would like password protected. No matter how seasoned your staff is, there is always room for improvement and additional training. It is often difficult to find ways to implement this training in your regular restaurant operations. Committing resources to training, choosing employees to do training, and making sure that training is a regular part of your restaurant operation takes a lot of effort, but is a key component to the success of your restaurant. Here are 4 great tips for implementing additional, effective training for your restaurant staff.